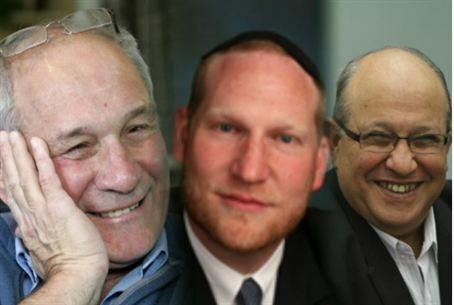 Rabbi Yehoshua Fass of Nefesh B’Nefesh, Former MK Rabbi Chanan Porat, and former Mossad director Meir Dagan receive Moskowitz Prize in Jerusalem. Rabbi Yehoshua Fass, co-founder of the Nefesh B’Nefesh English speakers’ aliyah movement, Former MK Rabbi Chanan Porat, who helped re-establish the community of Kfar Etzion after the 1967 Six Day War following his service as a paratrooper, and recently retired director of the Mossad, (Israel’s international spy agency) Meir Dagan were the recipients of the 2011 Moskowitz Prize for Zionism. The Prizes were awarded in ceremonies on Monday evening at Jerusalem’s City of David (Ir David), located across the road from the Western Wall (Kotel). Cherna Moskowitz, who founded the prize along with her husband Dr. Irving Moskowitz, was the first speaker of the evening. Dagan thanked the members of the Israeli intelligence community for their part in the award. In his acceptance speech, Rabbi Fass noted that he does not stand there on behalf of himself, and that Nefesh B’Nefesh is an operation behind which are many other individuals. He made particular mention of his friend Tony Gelbart, who founded the organization with him but could not receive the award because he does yet not carry an Israeli identity card. Rabbi Fass stressed that the organization is working on this to happen soon. Rabbi Porat, who received his award after Rabbi Fass, spoke of how he returned to Kfar Etzion following the Six Day War and founded the Gush Emunim settlement movement. “Despite all the obstacles we faced we built thousands of units,” he emphasized. Rabbi Porat also mentioned the story of his friend, Giora Ashkenazi, who fell during the battle for Jerusalem. He noted that twenty years, he had the privilege to perpetuate his friend’s name in Yeshivat Orot on Mount Olives, which was established with the unconditional support of Dr. Irving Moskowitz. The annual $50,000 prize was established to support Zionist values in Israeli society and to promote the Jewish nationalist home of Israel.